I recently learned that there will be 2 wrestling events coming to the Philippines, one with the oldies like Hulk Hogan, Rowdy Roddy Piper, Iron Shiek and other 80's superstars, and the more exciting and antipicated one being WWE Smackdown. It's set for October 21 and 22, 2006 at the Araneta Coliseum. I was able to watch both WWE Raw Live in Manila events last Feb. and I learned from my mistake back then: "don't wait for the last minute to buy your tickets". I almost wasn't able to buy the tickets I wanted. I was actually waiting for confirmation from friends that wanted to watch. I wanted to know what tickets they'd buy so I we can all be together. Therefore I will do 2 things which will benefit me. Second, I will create a fund for my ticket source. I'm definitely going. It's just when and what section I need to know. I just donated a P1,000. 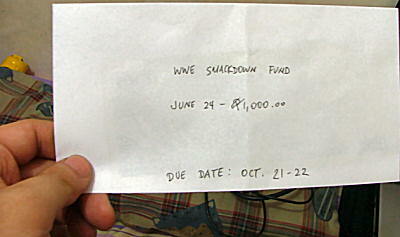 bill in an envelope labelled "WWE Smackdown Fund". hey. this is sucg a nice motivational tool to save. hehe. good luck jay! Do they really mean that ?